Our local real estate market ended 2018 on a much more positive note than it started – with home sales increasing steadily over the second half of the year. In total, 5,565 homes were sold in 2018 – with the average sales price increasing an impressive 5.22%. We anticipate continued growth in our local market, with some carryover of demand from 2018. Advice to sellers: Take advantage of the demand carryover in early 2019, listing in the early spring market with less competition. Advice to buyers: Rates remain at historic lows, with the potential for an increase as the year progresses. Act now to take advantage! F.C. 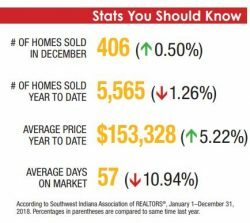 Tucker Emge REALTORS® finished the year selling over $500 million in real estate across Southwestern Indiana. We are proud to be the market leaders in our area. That leadership is the result of professionalism and expertise we bring to each client. When you are in the market to buy or sell, call the best – I’m ready to help!